Feedback is the voice of the customers. It can not only improve your bottom line and suggest further advancements but also give you the ideas for business development and competition sustainment. Nearly 95% of eCommerce shoppers read online reviews before making a purchase. 93% of consumers check local reviews and feedbacks to decide if a local business is good. 72% of customers don’t make a move until they read other customers’ feedback. 85% of purchasers trust old customers’ feedback as much as personal recommendations. 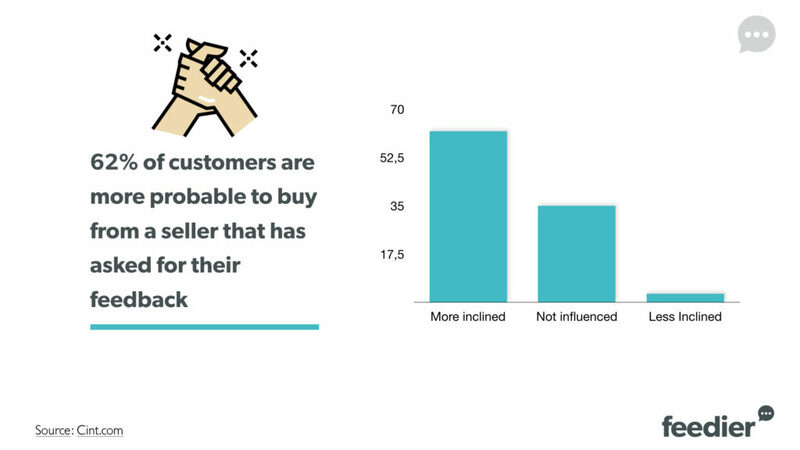 62% of customers are more probable to buy from a seller that has asked for their feedback. Bottom line: The way does not matter, but asking for customer feedback is not just a way to improve your sales but also a way to build healthy customer relationships. Feedback may or may not improve things, but if you do not showcase them, it will definitely degrade your brand and sales. Why Customers Don’t Leave Feedback by Themselves? Because you don’t want them to. This is what they think if you don’t ask them, or ask them with real vague ways. “Feel free to share your opinions” doesn’t sound persuasive enough. Seem like you don’t care, or you don’t need it, “I can do without your feedback” kind of thing. This approach will not secure any positive feedback. Unless someone is really frustrated by your brand and wants to avenge by drawing others away from your business, customers may not share their actual views with an uncertain approach. Most customers in 2019 know that you are mining for user-generated content. You don’t care for the reviews, ratings or feedbacks, but the user-generated content for your site. They think their feedback doesn’t matter for you, and it will end up in some dumped pile of other user-generated content of your website pages. What Is the Best Way to Get Feedback From Customers? The best way to proceed is letting them know that their opinions matter for you. You need their feedback because you want to improve and offer a better product or service the next time. You must not only choose the right words but also the right approach to showcases the significance of their feedback without sounding greedy or selfish. Ask yourself about the purpose of a feedback request you will make. Use free flowing subjective responses instead of just ratings or stars. Ask the questions that induce a subjective response rather than a simple “Yes” or “No”. Don’t sound like a bot or auto-generated content, keep as many human touches. Personalize the request wherever it is possible. For example, in personalized emailers. Use the same tone as your audience. Think about a real conversation and don’t ask very complicated terms. Instead of a vague survey form like a spreadsheet to fill, make it visually appealing. Avoid using any negative word, such as “any”, “no, “neither”, and be positive. What Are the Best Ways to Collect and Ask For Customer Feedback Online? Be it an eCommerce site or any business touch point, advancement in web technologies have made it possible to integrate feedback collectors in the most innovative ways. Following are some cutting-edge ways to collect reviews, ratings, and ask for customer feedback through varied mediums. You may dedicate an on-site feedback collection form, or it could also be a multi-utility form. For example, you can integrate a short dedicated survey at a visible block on your website, or you can just use your contact us form. The approach is different for different businesses. A general business website can integrate the Ticket Management System with the ‘Contact Us’ or a dedicated feedback form. Later you can manually display them on feedback or a dedicated testimonial block. Things work a little different for eCommerce websites. You need to be more specific, clearer and need deeper insights that tell you how exactly the customers behave with your website and the business. One of the best ways for feedback collection on eCommerce sites is integrating a feedback widget with defined sets of easily answerable questions. Keep in your senses that the questions must not seem like work. They must go along with the regular flow and should not cause any obstruction to the regular browsing behavior. Here is a good example from Feedier Widget that integrates with all kinds of sites and you can customize the questions to fit your requirements. You can design a complete flow with questions and the ability to rate on each of the aspects you wish your customers should tell you. One other way is tracking the heat maps of your eCommerce site. 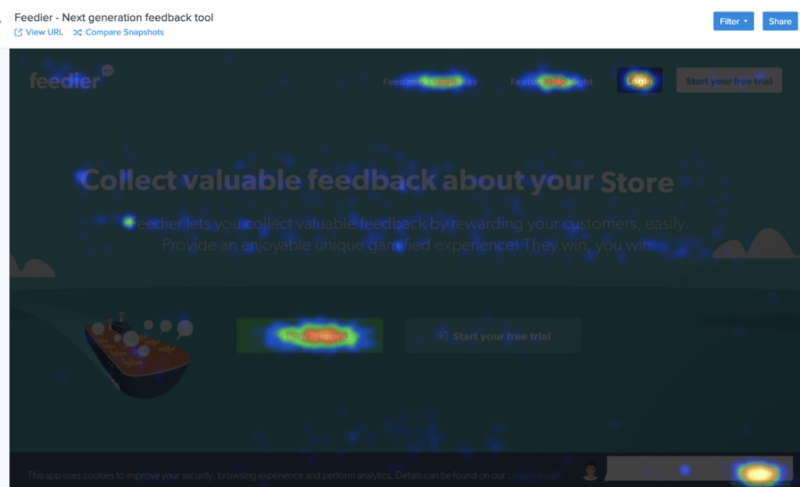 You can integrate a heat-map tool that will track the browsing behavior of your visitors and give a graphical representation of the most attractive and the least performing assets of your site. The representation can give you an insight into useful metric like users’ entry point, exit point, how far they scrolled down the pages, which section receive most and least of the attention. These insights act as indirect feedback, which offers a direct idea of how your customers feel about your site. Some heat map tools like FullStory and CrazyEgg also let you see the replay of the browsing sessions. 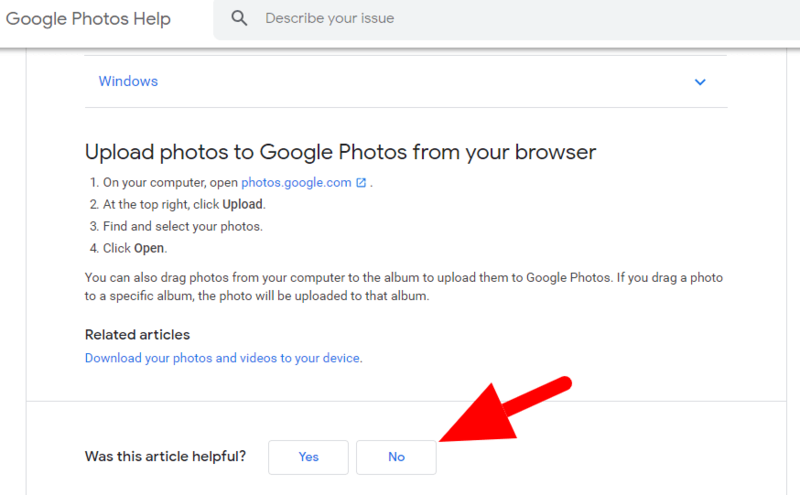 You can use these insights for not just feedback collection but also as an opportunity to shape your site strictly according to your customers’ browsing behavior. You can also integrate feedback collection systems in your self-help portals. Customers visit these areas more often once they purchase a product or service. After using them, they generally have some questions in their minds, which they intend clarifying. Self-help portals like FAQs are the best ways to interact and collect feedback. 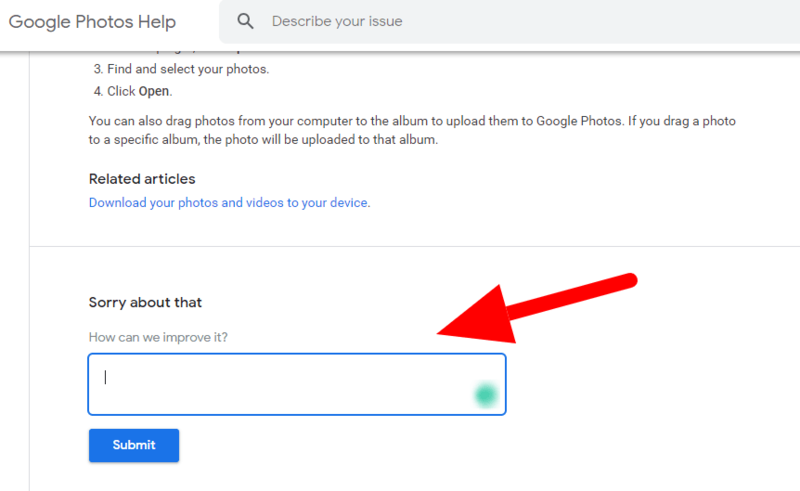 The best part is Google makes it more motivational by addressing the issue based on the feedback. If you’re using a knowledge base portal like HelpDocs, you can directly ask for customer feedback using an integrated widget. 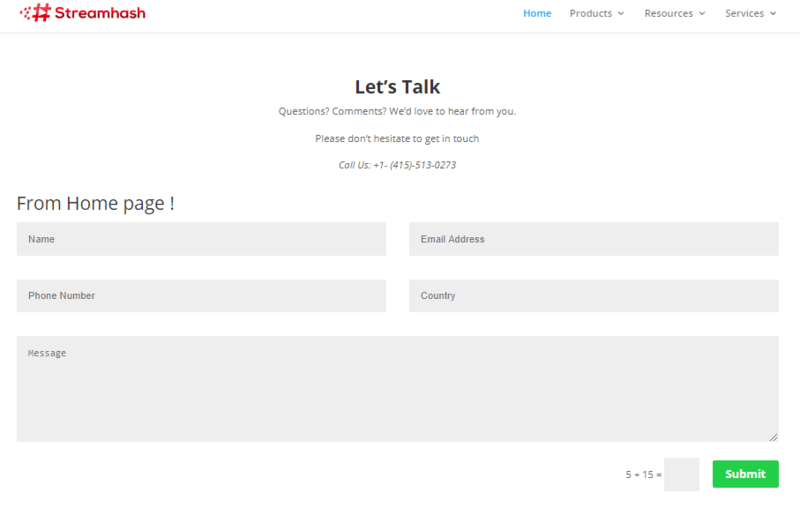 Websites these days have integrated live chats features to help customers. E-Commerce websites have personalized eCommerce chatbot that collects data, addresses queries, and also help in guide shopping. General websites too have the best chatbot with manual- and AI-based processing. In all these value-added integrations, you can get uninterrupted ways to collect feedback from your customers. In fact, Facebook Messenger bot uses user feedbacks to learn new stuff. A simple feedback integration in live chat and chatbots will not only help you improve their service but also attract new customers with lead generation. 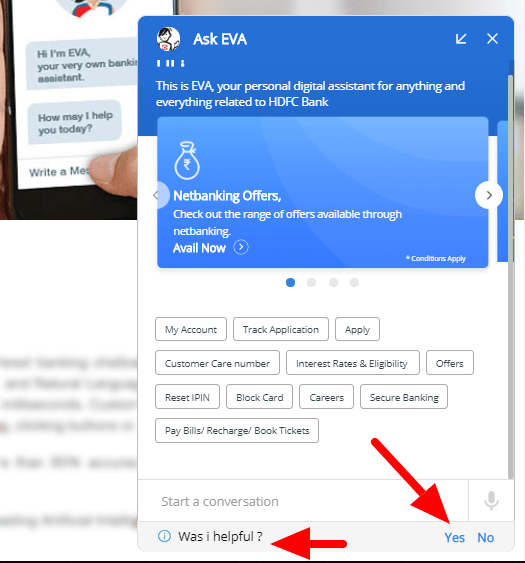 For example, the following is a chatbot integration on a banking site. The bot asks for feedback on each query it serves and also lets users give subjective comments. You can use a similar integration on your live chat or chatbot to make feedback collection more effective and motivational for the users. Customer satisfaction and customer loyalty are two interlinked phenomena. It motivates a satisfied customer to become loyal to your brand. A loyal customer is always a satisfied one. However, to collect feedback, satisfaction is not the only motivation. Satisfied or even unsatisfied customers can be encouraged to provide feedback with rewards and benefits. Make your approach a rewarding one for the customer. Give them some incentives like coupon codes, discount vouchers, and free e-books, etc. and they will be more inspired to fill up a feedback form. For those who do not respond, you can link an incentive and contact the non-responders again. Offering an extra incentive to those who haven’t responded will definitely encourage them to respond. You can also use Feedier which offers support for survey incentive right out of the box. 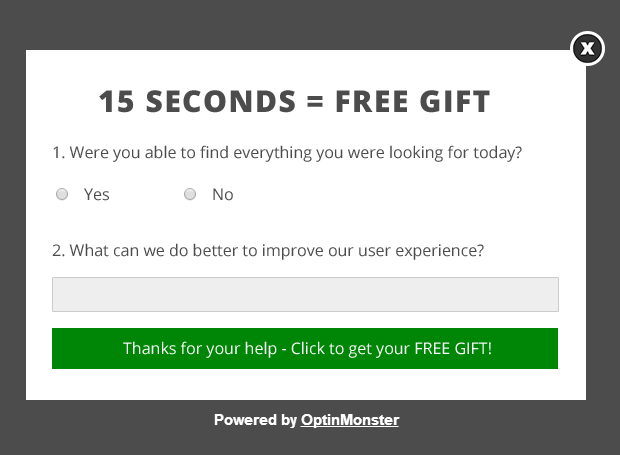 So you can configure the rewards, probability, and value of your gift on a survey basis. You not only increase your response rate but also value your customers’ time and energy. 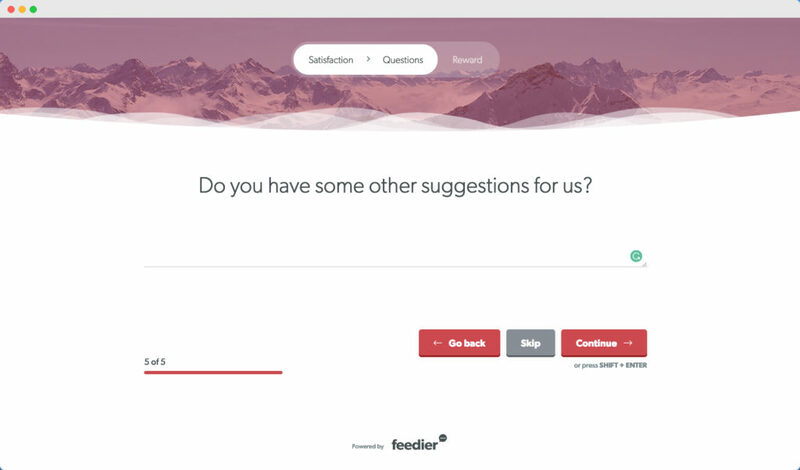 Use Feedier for your customer surveys and start collecting actionable feedback today. Businesses spend years building a solid email list. They earn these assets over the time putting all those efforts in audience research, outreaching, making past the spam filters and finally getting a reply. A solid list which gives you some good conversion is the best target for collecting feedback as well. In one go you can interact with all your past and present customers, and even the future prospects. Feedback from customers and prospects make a good mix of analytics to improve on your part. Utilize these valuable assets and create some impressive email templates for feedback collection. Don’t forget the best practices I discussed earlier in this article. You can use a catchy headline like below. Additionally, you can use the Feedier Widget to incentivize your feedback campaign and encourage as many users to participate in the campaign. With the ability to set different types of rewards, Feedier can help you set up some lucrative stuff for enthusiastic participation by your prospects. Social media is a place where internet users spend most of their times. Platforms like Facebook, Twitter, Instagram, and YouTube give innovative ways to collect feedbacks in form of audience polls. You can use your social fellowship and ask for customer feedback in a quick way. Or you can create a poll on Facebook, Instagram, and Twitter and share it within your group, page, and followers. I know user-generated content is an ultimate weapon to drive conversions these days, and it helps in improving the page SEO too. However, a feedback request motivated only by these two intentions is hardly a good choice. Customers these days have gone way smarter than you think. If they even get a sniff, they will discard your request. Be honest and collect the feedback for improvement in your products and services. Ask for customer feedback the right way. Let your customers believe that you care for their opinions and intend on improving things accordingly. So don’t just do it to show off but to make things better for your audience.